In systemic lupus erythematosus (SLE) it has been hypothesized that self-reactive B cells arise from virgin B cells that express low-affinity, nonpathogenic germline V genes that are cross-reactive for self and microbial antigens, which convert to high-affinity autoantibodies via somatic hypermutation. The aim of the present study was to determine whether the VH family repertoire and pattern of somatic hypermutation in germinal centre (GC) B cells deviates from normal in SLE. Rearranged immunoglobulin VH genes were cloned and sequenced from GCs of a SLE patient's spleen. From these data the GC V gene repertoire and the pattern of somatic mutation during the proliferation of B-cell clones were determined. The results highlighted a bias in VH5 gene family usage, previously unreported in SLE, and under-representation of the VH1 family, which is expressed in 20–30% of IgM+ B cells of healthy adults and confirmed a defect in negative selection. This is the first study of the splenic GC response in human SLE. Systemic lupus erythematosus (SLE) is characterized by polyclonal B-lymphocyte activation, which leads to production of autoantibodies with various specificities, principally against nuclear antigens including double stranded (ds)DNA, ribonucleoprotein particles, histones and nonhistone chromatin proteins. Other antibodies bind cell surface structures and cytoplasmic antigens. Of these, serum high-affinity IgG antibodies that are specific for native dsDNA are believed to be the principal pathogenic agents and are used as a diagnostic indicator . These autoantibodies differ from anti-DNA antibodies found in the sera of healthy individuals in that they bind to dsDNA with high affinity, they are often cationic in charge and they do not usually cross-react with unrelated antigens . Despite intensive study, the factors that lead to the production of such autoantibodies remains in dispute, although a number of hypotheses have been suggested. Previous studies, using serum antibodies, hybridomas generated from peripheral blood lymphocytes (PBLs) and mouse models, concluded that autoantibodies produced in SLE are associated with particular properties. These include expression of characteristic idiotypes, clonal restriction of anti-DNA and anti-Sm antibodies, somatic hypermutation, V gene bias, and the presence of positively charged complementarity determining region (CDR) residues or sequence motifs in anti-dsDNA antibodies . V(D)J rearrangement of immunoglobulin genes has the capacity to generate an immense repertoire of immune receptors that are able to recognize virtually any foreign substance via somatic hypermutation, but because of the nature of this process a number of immune receptors with specificity for self molecules are also generated. These self-reactive B cells are normally eliminated in the bone marrow, but self-reactivity can also be generated in the periphery by somatic mutation. For example, mutation of a single amino acid at position 35 on the heavy chain culminates in a switch from anti-phosphoryl choline (a bacterial hapten) to anti-dsDNA . This supports the hypothesis that the aetiological stimulant of the autoimmune response observed in SLE may be of bacterial or viral origin, and this is further supported by the observation that the anti-DNA response is clonally restricted in both mouse models and SLE patients [5, 6]. This hypothesis suggests that self-reactive B cells may arise from B cells that express low-affinity V genes, which are cross-reactive for self and microbial antigens, by somatic hypermutation to generate high-affinity autoantibodies. There have been only a limited number of studies on the immunoglobulin V gene repertoire and somatic hypermutation in SLE, with the majority of those investigations performed in PBLs. PBLs comprise a population of recirculating memory cells that have encountered a vast range of antigens, including many environmental antigens, over a prolonged period of time, whereas germinal centres (GCs) in the spleen or lymph nodes provide a profile of B cells that respond to antigen at a given time point. In an earlier investigation, Ravirajan and coworkers [7, 8] demonstrated the presence of autoantibody-producing B cells in the spleen of an SLE patient by analysis of hybridomas generated from splenic B cells. The aims of the present study were to identify the immunoglobulin V genes used by proliferating B cell clones in GCs of a SLE spleen, and to determine whether there are abnormalities in the pattern of somatic hypermutation and antigen selection. To our knowledge, this is the first detailed study of the repertoire of the splenic GC response in SLE. The spleen used for this investigation was removed from a female SLE patient (M) because of hypersplenism secondary to persistent haemolysis and thrombocytopaenia. Patient consent was obtained using standard practice procedures at the time. The patient fulfilled the American Rheumatism Association criteria for SLE , with the presence of arthritis, photosensitive skin rash, an autoimmune haemolytic anaemia, lymphopaenia, thrombocytopaenia, and homogeneous antinuclear antibodies characterized as anti-DNA antibodies. At the time of splenectomy the patient had detectable antibodies against DNA (Crithidia negative), and IgA and IgM antibodies against cardiolipin. The spleen was cut into small pieces and snap frozen. Serial frozen sections (6–8 μm thick) of the spleen, which had been stored at -70°C, were cut with a cryostat and mounted on slides precoated with 2% 3-amino-propyltriethoxy silane (Sigma, Poole, UK). Sections were air dried, fixed in acetone for 10 min and stored at -70°C with desiccant. Frozen sections were stained using mouse monoclonal antibodies for B cells (anti-CD20; DAKO A/S, Cambridgeshire, UK), T cells (anti-CD3; DAKO A/S), proliferating cells (anti-Ki67; DAKO A/S), follicular dendritic cells (FDCs; Wue2) and plasma cells (Wue1). (The latter two were both kindly donated by Dr A Greiner, University of Würzburg, Germany.) This was followed by incubation with rabbit anti-mouse IgG (DAKO A/S), and an alkaline phosphatase/anti-alkaline phosphatase complex (DAKO A/S). Immune complexes containing alkaline phosphatase/anti-alkaline phosphatase were detected by incubation with new fuschin substrate, and the sections were counter-stained with Mayer's haematoxylin (Sigma). GCs were identified by staining with anti-CD20 and anti-FDC. They were microdissected under sterile ultrapure water using sterile blood lancets attached to Narishige micromanipulators (Nikon, Telford, UK), linked to an inverted microscope (Nikon). Excised tissue was digested in 30 μl proteinase K (0.7 mg/ml; Boehringer Mannheim, Mannheim, Germany) at 50°C for 1 hour, which was then inactivated at 95°C for 10 min. This DNA preparation was used as a template for subsequent primary PCR reactions. To avoid contamination with amplified immunoglobulin V genes, all procedures prior to primary PCR amplification were performed in a separate clean laboratory to that where all steps after amplification were carried out. Nested PCR was performed using a mixture of primers for the leader sequences of all of the VH families with a universal JH primer, in the primary amplification. All primers used are described in detail elsewhere . For primary amplification, the conditions used for 35 cycles were 94°C for 1 min, 61°C for 1 min and 72°C for 2 min, followed by one cycle at 72°C for 15 min. The Taq polymerase used was of high-fidelity quality (Expand Easy; Roche, Mannheim, Germany), which has a very low error rate. Secondary amplification used individual primers for each of the first framework regions of each VH family in conjunction with a JH primer mix. Cycle conditions for secondary amplification were 94°C for 1 min; 61°C for 1 min in the case of VH1–3 and 65°C for 1 min in the case of VH4–6; and 72°C for 2 min for 40 cycles; followed by 72°C for 15 min. This method ensures that only rearranged V (D) J genes are amplified. Successful secondary amplifications were identified as a band corresponding to a product of approximately 400 base pairs on an agarose gel. The bands were excised and subsequently purified using QIAquick cleanup columns (Qiagen, Sussex, UK). The amplified DNA was then ligated with TA-cloning vector pCRII, and transformed into IFN-αF cells (Invitrogen, Paisley, UK) and cloned. Plasmid DNA from clones containing gene inserts was prepared using QIAprep spin mini-prep kits (Qiagen, Sussex, UK), according to the manufacturer's instructions, and precipitated, washed thoroughly and resuspended in 10 mmol/l Tris-HCl (pH 8.5). Cloned, rearranged immunoglobulin V genes were sequenced in an ABI Prism 377 DNA sequencer (Applied Biosystems, Warwickshire, UK). Germline immunoglobulin V genes providing the best match to the cloned DNA sequence were identified by blast searching the Vbase Sequence Directory of human germline immunoglobulin V genes . Sequences were aligned and compared using the DNA plot 1.4 programme (W. Müller, Institut für Genetik, Köln, Germany). The nomenclature for the V, D and J gene segments adopted here and the definitions of the CDRs were previously described [11–13]. Family trees were constructed by analysis of mutations shared by sequences with the same V-D-J rearrangement. Replacement : silent ratios (R/S ratios) were calculated by analyzing whether a mutation resulted in an amino acid change (replacement mutation) or not (silent mutation). 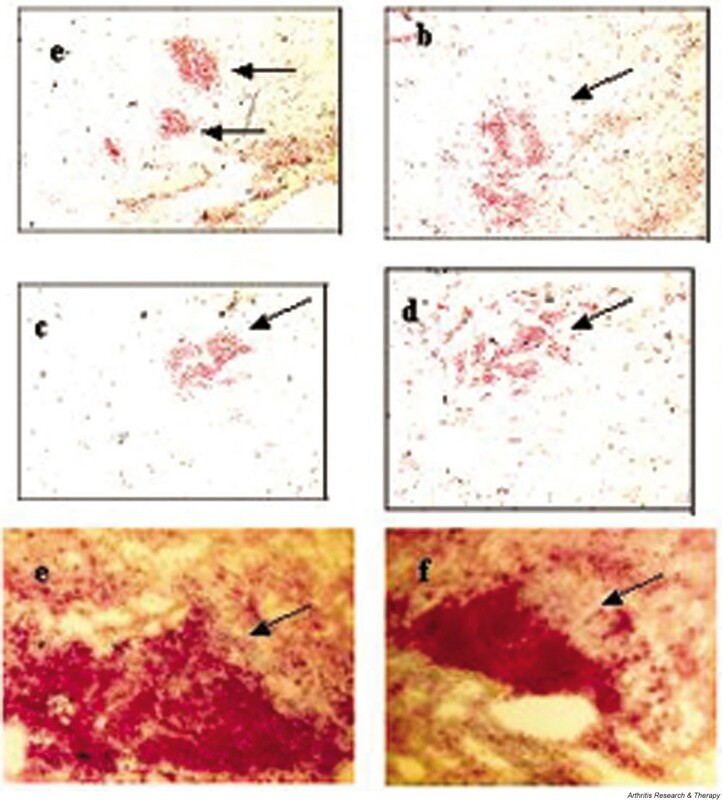 Clusters of B cells and FDCs, which resembled GCs, were identified in frozen sections of the SLE spleen by staining with anti-CD20 and anti-FDC, respectively. Two GCs (GC A and GC B) were excised and the rearranged VH genes amplified (as described under Materials and methods). Both GCs were located within the same 0.5 cm3 portion of spleen tissue. GC A can be seen in Fig. 1, and has two distinct areas of staining for FDC and one large area of B cells encompassing both FDC regions. Very few T cells could be seen within GC A and B, and no plasma cells could be seen at all within the GC structure itself. No distinct mantle zone was observed surrounding either GC. Immunohistochemistry of sections from a patient with systemic lupus erythematosus. (a) Anti-FDC (follicular dendritic cell) staining within the area known as germinal centre (GC) A. (b) Staining for CD20. FDC staining suggests two possible GCs within close proximity, but B-cell staining shows no clear demarcation. (c) Anti-FDC staining for GC B. (d) staining with anti-CD20. Panels (a) and (b) are consecutive sections, as are (c) and (d). Panels (e) and (f) show B-cell clusters identified using anti-CD20 on serial sections: (e) B-cell cluster C; (f) is B-cell cluster D. The arrows indicate the areas of positive staining for the marker in question. All images: 100×. Two other areas, shown in Fig. 1 (e and f) appeared to be made up entirely of B cells because there was no positive staining for any of the other cell markers. These were referred to as B-cell clusters C and D.
In total, 15 rearranged VH sequences were analyzed (including seven independent V-D-J rearrangements) for GC A and 16 (six V-D-J rearrangements) for GC B. From B-cell cluster C, 37 functional and six nonfunctional VHsequences were analyzed (16 V-D-J rearrangements) and cluster D yielded eight functional and 16 nonfunctional sequences (seven V-D-J rearrangements). The best matching germline V gene sequences corresponding to each of these rearranged sequences were identified (Table 1 and Fig. 2). The VH locus in humans consists of 51 functional VH segments, which are classified as families VH1 through to VH7. VH gene family usage of the combined GCs and B-cell clusters differs significantly from the expected frequencies, assuming that each germline gene is equally likely to form a viable rearrangement (P < 0.001). In particular VH1 was completely absent, whereas it is normally expressed in 20–30% of PBL B cells (P = 0.0066), and VH5 was observed in 16.6% of the VH sequences in the present study as compared with the 3.92% that is theoretically expected (P = 0.046). The D gene family use was skewed towards D2 but the small number of possible D genes makes it difficult to determine the significance of these findings. The JH family expression exhibited by the SLE spleen studied here differed significantly from the expected values (P = 0.0015). For example, J4 was over-expressed, and J1 and J2 were under-represented. VH gene family usage. 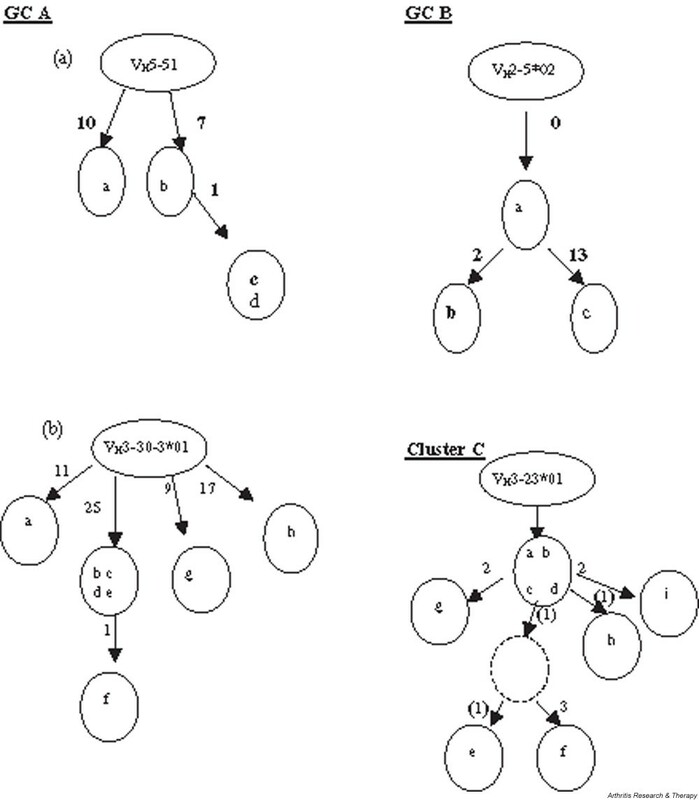 (a) Comparison of VH gene family usage of functional rearrangements found in the combined germinal centers (GCs) and B-cell clusters. VH gene family usage differed significantly from the expected frequencies, assuming each germline gene is equally likely to form a viable rearrangement (P < 0.01). VH1 was significantly under-expressed (P = 0.0066) and VH5 over-expressed (P = 0.046). (b) D gene family use. (c) JH family usage differed significantly from expected (P = 0.0015). The best matching germline sequences identified from blast searching the Vbase database from which the rearranged V-D-J sequences identified from germinal centre (GC) A and GC B, and B-cell clusters C and D were derived. Groups of sequences were deemed to be clonally related when they used the same V, D, J and CDR3, and differed only by base substitutions. The total number of members of each clone is given in the right-most column, and the number of these members that are nonfunctional is indicated in brackets. Identical sequences are only counted once. From these data we can see that GC A and GC B do not share any common B-cell clones. We can also see that by far the most common VH family present is VH3 for both GCs. Analysis of V gene sequences indicated that a number of B cells shared common V, D, J and junctional sequences for which mutational analysis was carried out (described below). The VH3 family is again highly represented in B-cell clusters C and D, specifically VH3–23, which is known to be among the most highly expressed genes in normal individuals. However, VH5–51, one of only two functional members of the VH5 family, is also found in large numbers here. In fact, 10 of the VH5 sequences were shown to use the same V-D-J rearrangement. From a total of 36 different rearrangements (all four areas combined), six independently rearranged groups of genes used the VH5–51 gene. 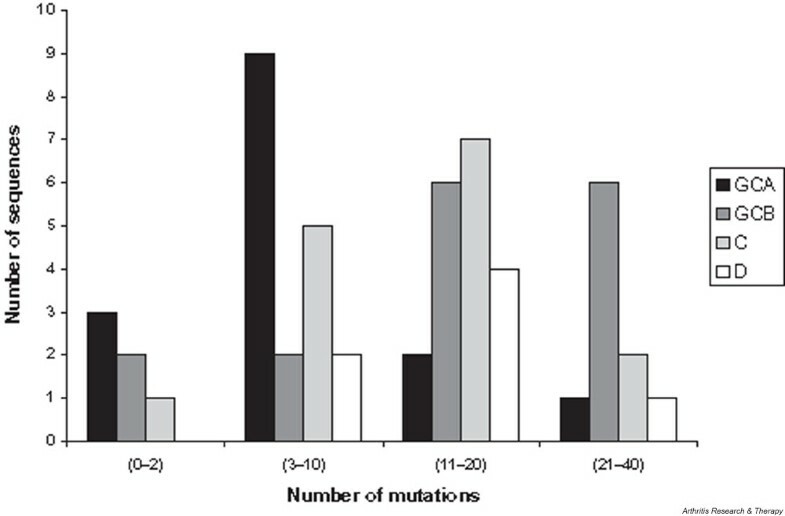 The distribution of the frequency of mutations for all four areas is shown in Fig. 3. The data represent a mean average number of mutations per sequence of 7.6 for GC A, 15.8 for GC B, and 15 and 14.9 for clusters C and D, respectively. All data sets, excluding B-cell cluster D, contained at least one sequence in the 0–2 range, and the majority of GC A VH genes contained 3–10 mutations. The location of the mutations observed was categorized as being within the framework region (FR), CDR1 or CDR2. CDR3 was ignored for mutational analysis because of difficulty in distinguishing between point mutations and junctional variation in this region of the variable gene because of recombination events. The distribution of mutations between VH gene sequences in germinal centre and B-cell clusters. Although mutations were seen in higher numbers in the FRs, this can be attributed to the fact that these segments are longer and there is therefore increased likelihood of random mutations occurring. In order to correct for this, the number of mutations in each segment is expressed as a percentage of the total number of bases in that segment (Fig. 4). The graph illustrates the fact that there is a higher frequency of mutation in the CDRs than in the FRs, which is typical of an antigen-driven response. Graph showing variable region mutations as a percentage of the total length of each region of the V gene segment. Although there are fewer mutations in the complementarity determining regions (CDRs), the segment is also much smaller so the mutational frequency is higher than in the framework regions (FRs). R/S mutation ratios were calculated for the total VH segment, FRs and CDRs (Table 2). The ratio for each individual clone is shown, as well as the R/S value of all the clones together, disregarding all individual sequences. The R/S ratio of framework regions of VH genes from GC A and cluster D was remarkably high in comparison with that seen in other studies of mutations in VH genes of both autoimmune and healthy patients, whereas that for the CDRs of GC A was not significantly above random. The R/S ratios calculated for GC B were more in accord with those previously reported. The R/S ratios for the CDR are much higher than random, with the framework ratio being slightly less than random. This indicates that affinity selection of B cells with replacement mutations by antigen is taking place. Replacement : silent ratios (R/S ratios) were calculated for the complete VH segment as well as individual complementarity determining regions (CDRs) and framework regions. The ratios for each individual clone are shown as well as the R/S value of all the clones together, disregarding individual sequences. The colons represent instances where there are no silent replacements, therefore no figure can be given since it is not possible to divide by zero. As Table 1 shows, there are a number of B cells within all four areas that share the same germline genes. These sequences are deemed to be clonally related if they share the same V, D and J germline genes, as well as having common junctional sequences. Genealogical trees were constructed for all clones containing three or more members. The most dominant V gene amplified from GC B was VH3–30.3*01 followed by VH2–5*02. Genealogical trees constructed from these clonally related sets, as well as VH5–51 from GC A and VH3–23*01 from cluster C, are shown in Fig. 5. This provides clear evidence that these clones of B cells are proliferating and mutating in the splenic GCs and B-cell clusters. Clonal genealogical trees constructed from sequence data from germinal centre (GC) A, GC B and cluster C. Numbers in bold indicate the minimum number of mutations required between each sequence. The bracketed figures represent silent mutations. The dashed circle shown in cluster C represents a hypothetical intermediate that was not actually found among the sequences. GC A contained two highly mutated B cell clones represented as (a) and (b). There is evidence for a bias toward serine codon usage within immunoglobulin variable genes , especially within the CDRs. From all of the sequences amplified from all four sites, 70% of the serines present within CDR1 and CDR2 were AGC or AGT. This was not the case for the FR, in which TCC was the most frequent serine codon present. Only AGC and AGT produced replacement mutations within the CDRs, of which the most prevalent was from serine to asparagine; other mutations included serine to threonine, tyrosine, aspartate, methionine and proline. The immunohistology of the spleen from the SLE patient produced a picture similar to the cellular architecture of healthy spleens in mice  and humans , which is known to be interspersed with GCs. In the present study, however, a mantle surrounding the GC was not identified. Each mature GC is generally derived from one to three B-cell clones, which manage to survive a significant reduction in clonal diversity and then go on to endure V(D)J hypermutation. The GC is of most interest because it is the site of antigen driven V(D)J hypermutation and selection  where antigen-specific B cells acquire point mutations in the V regions of transcriptionally active rearranged immunoglobulin genes. These mutations accumulate steadily during expansion of B-lymphocyte clones in the dark zone of the GC. This clonal evolution occurs independently in each GC, because little trafficking of B cells between GCs has been observed . The cellular components necessary for a GC response were present in both GC A and GC B (i.e. B cells, FDCs capable of presenting antigen and T cells). However, none of the GCs and B-cell clusters had a discernible mantle zone. No plasma cells were located within the GCs themselves but they were loosely distributed in the surrounding tissue within close proximity to the GCs (data not shown). The immunohistochemistry also demonstrates that both GCs are of approximately equal size, which validates comparison of the data produced from each. A recent study in Science  identified autoreactive B cells in MRL.Faslpr mice proliferating in the T-cell zone of lymphoid tissues. This was thought to be due to their deficiency of the Fas receptor, because these cells would normally be deleted through the Fas receptor/Fas ligand-mediated pathway of apoptosis. A similar explanation may account for the GCs identified in this study not exhibiting a traditional mantle, and explain the lack of negative selection illustrated by the low number of nonfunctional genes. Of the total number of rearranged VH genes, 19% were found to contain stop codons and out-of-frame rearrangements, and were therefore deemed to be nonfunctional, the majority being found in cluster D. This correlates with a similar study conducted by Jacobi et al. , who found 13% of PBL VH gene sequences amplified from an SLE patient to be nonfunctional, as compared with 53% of genes amplified from PBLs of a healthy individual. Those investigators observed a similar R/S ratio in the productive rearrangements to that seen in the nonproductive rearrangements. It was therefore suggested that there may be some abnormality in selection in SLE related to an intrinsic failure of B-cell apoptosis or enhanced B-cell activation by T cells, which overwhelms protective mechanisms that are effective in normal individuals. The most abundantly expressed VH gene family was VH3, which is not surprising because it is the largest family and has been found to be the most dominant in the normal repertoire . What is perhaps more interesting is the large number of VH5 sequences (16.6%) as compared with the 3.9% expected to be produced randomly in the normal human repertoire. VH5–51 has also been isolated from breast tumours (Nzula et al., unpublished data) and thymic GCs from a patient with myasthenia gravis  previously in our laboratory, but not from GCs from the salivary glands of two patients with Sjögren's syndrome, using the same primers . It is therefore unlikely that the family VH5 primers used here preferentially amplify VH5–51. VH5 sequences have been consistently associated with IgE antibodies, and it has been suggested that these antibodies may be associated with an unidentified superantigen . Two studies analyzing anti-DNA antibodies in SLE both identified a heavy chain clone comparable to VH5–51 [23, 24]. Comparison of our V-D-J rearrangements with the two anti-DNA specific antibodies revealed very few somatic mutations in common, however. One hotspot highlighted at position 77 (in the tip of the FR3 loop)  was found to be present in the anti-DNA specific antibodies as well as in most of the analyzed VH5–51 sequences from this study, but this was not often the same amino acid substitution. VH5–51 was also used by two human IgG monoclonal antibodies that bind phospholipid, derived from the PBL of a SLE patient. In this instance the J segment used was JH6b, which was not found in combination with VH5–51 in the present study. It may be significant that patient M produced anticardiolipin antibodies, but not anti-dsDNA, although there is no direct evidence that the cardiolipin antibodies used VH5–51 because no information about the specificity of these antibodies was obtained. A complete absence of VH1 family genes was observed in the present study of splenic GC, which contrasts with the theoretically expected value of 20–30%. This was also found to be the case in another study of SLE patients conducted by Hansen et al. . They found that 13% of functional PBL V genes from healthy control individuals were from the VH1 family, but only about 1% of the VH genes expressed by PBLs of a SLE patient used this family. de Wildt et al. , on the other hand, found very little difference between expression of VH1 in healthy control individuals and SLE patients. The PBL B-cell repertoire may not reflect the repertoire of splenic B cells. Using high-fidelity Taq polymerase and the same primers as used here, the PCR error rate for VH genes was less than one base per four VH genes . The average numbers of single base mutations in the VH genes from GC A and GC B were 7.6 and 15.8, respectively, and for clusters C and D they were 15 and 14.9, respectively. This is significantly higher than the Taq polymerase error rate, demonstrating somatic hypermutation in vivo. The difference in mutation rates between the two GCs may indicate that they are in different states of maturity or that GC B might have been founded by a memory B cell that was already mutated (e.g. the founder cell of clone B-b; Fig. 5). Hypermutation within a GC is closely linked to antigen-induced B-cell proliferation; thus, from the data presented here, this appears to be the case in both GCs and the B-cell clusters. The second phase of this process, during an immune response against a xenoantigen, is selection of B cells that express high-affinity antigen receptors resulting from rare mutations, by competition for binding to antigen on the surface of FDCs. This process is generally believed to result in an increase in the ratio of replacement to silent mutations, especially within CDRs, and often in selection against replacement mutations in the FRs. The evidence presented here is supportive of antigen selection in GC B and clusters C and D, in which the R/S ratio is higher than random in the CDRs. Selection for replacement mutations in the FRs has previously been observed, for example in two anti-hen egg lysozyme antibodies (HyHEL-5 and HyHEL-10) [28, 29], in which both had contact residues in the FRs. It is also possible that the high R/S ratio in the FR region of the sequences in this study are the result of antigen selection, but this was not confirmed because of the absence of data on specificity. A serine codon bias was also observed (not shown), with 70% of the serines in CDR1 and CDR2 represented by AGC or AGT, both of which are recognized targets of the hypermutation machinery (for review ). Only AGC and AGT serine codons produced replacement mutations in the CDRs. Of these, the mutation from serine to asparagine was the most prevalent, which is in accordance with mutational analysis performed on patients with myasthaenia gravis . The clonal genealogies show that the groups of rearranged VH genes included sequences that could be assigned to parental and daughter cells on the basis of shared mutations and junctional sequences. By far the most dominant sequences were VH3–30*01 and VH5–51*01 (approximately 16% each). In studies of PBLs in SLE, the most common VH segment observed was VH3–23 (12%) , which we have seen in similar numbers (11%). The present study highlights a possible bias toward expression of VH5 immunoglobulin V genes by splenic GC B cells in SLE, as well as normal high levels of VH3 and an under-representation of VH1. It also confirms that there is a defect in the negative selection process in SLE patients. This project was funded by the Arthritis Research Campaign. We would like to thank Rod Ferrier (Department of Pathology, University of Glasgow) for cutting frozen sections, and Dr Ian McKay for assistance with statistical analysis. This article is published under license to BioMed Central Ltd. This is an Open Access article: verbatim copying and redistribution of this article are permitted in all media for any non-commercial purpose, provided this notice is preserved along with the article's original URL.